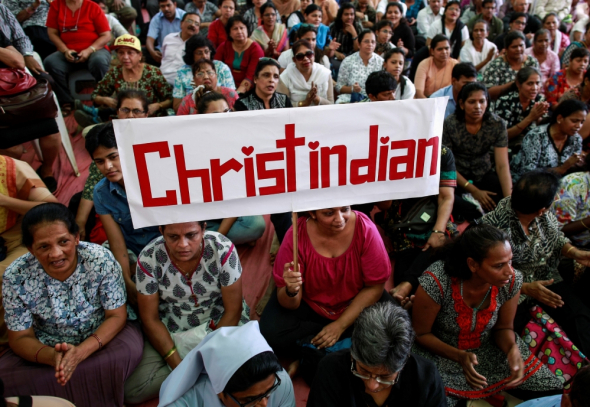 (Reuters/Danish Siddiqui)Christian Indians protest against religious attacks. From the beginning of their independence from Britain, both Pakistan and India have promised to respect the rights of religious minorities, and recognize the equal citizenship of the believers of all faiths. The Catholic publication Crux says that after 70 years, both countries have struggled to fulfill that promise, but Christians living on the subcontinent take pride in their contributions to their societies. On August 25, 1947 British India became two different countries: India and Pakistan. Nirmala Carvalho writes in Crux, "The awkwardness of their birth - with Muslim-majority Pakistan comprising Western and Eastern halves carved out of the Hindu-majority subcontinent - means their birthdays are celebrated on either side of midnight: August 14 in Pakistan, and August 15 in India. (East Pakistan became the independent Bangladesh after a short war in 1971, and observes its independence day on March 26.)" Christians in Pakistan represent just two percent of the population in the overwhelmingly Muslim nation, and one gripped for the last 30 years by a rising tide of extremism. In Pakistan Christians are often poor and members of ethnic and linguistic minorities, "so they're doubly or triply at risk., and promised to respect the freedom to worship of their citizens." Jinnah said, "You are free to go to your temple; You are free to go to your mosque or any other place of worship in this state of Pakistan. To whatever religion, caste or faith to which you belong, there will be no discrimination or distinction. We are all citizens with equal rights." Arshad said he wanted to tell young Catholics of the nation to work together to build a society that honestly reflects those ideals, and to promote peace. "We are all equal citizens, and it is essential that our youth must work together for brotherhood and solidarity, justice and equality and work for religious tolerance and mutual respect," the bishop told Crux. "I strongly believe that together with one thought, we can achieve a prosperous, peaceful and an advanced country." However, Arshad said the presence of Christians in Pakistan is like the "salt of the earth and light to the world," despite the many challenges. "Pakistani Christians have played a significant role in the formation and development of the country," he said. "Our people stand firm in their faith and also foster a culture of dialogue with our Pakistani brothers and sisters of other faiths." The bishop said the path of inter religious dialogue is the only way to peaceful coexistence. Dominican Father James Channan, the Director of the Peace Center Lahore, said that Christians believe in the dream of Jinnah, which is a Pakistan where members of all faiths are equal citizens. "Our country is faced with both internal and external threats," Channan said. "Most of the people still remain poor and there is a great lack of security, basic health and shelter facilities. The extremism and fundamentalism is a great threat to our nation." The priest said one of the biggest problems is political instability and corruption in government. "In spite of all that, this day reminds us to play our full role for the development and prosperity of our country," Channan said. He said there were several interfaith conferences organized to celebrate Pakistan's independence, and churches across the country held prayer services and offered Masses for the country and its stability. Across the border, India has also been experiencing a rise in extremism, but promoted by Hindu nationalists. Crux wrote that incidents of harassment have increased over the past few months, with various Christians being detained or arrested for "attempted conversion," and places of worship being vandalized. More recently, a spate of killings related to "cow vigilantism" have happened around the country. For India's Hindus cows are sacred and the slaughter of cows is illegal in most parts of India, although beef is often eaten by some Dalits (low-caste Hindus previously called "untouchables") and members of some religious minorities, such as Muslims and Christians. Bishop Theodore Mascarenhas, the secretary general of the Catholic Bishops' Conference of India, said despite this, India is a "very tolerant community" which has given space for the Catholic Church over the past 70 years. "Our hopes and aspirations for this country are that this tolerant spirit, peace and traditional harmony we have been enjoying, continue, so that we can continue contributing to nation-building and to the good of this country," he told Vatican Radio. "We also hope and pray that this country might go forward with inclusive development for all its people, taking in the poor, the marginalized, the tribals, the Dalits and the poor, with whom our hearts are always there as Catholics and as the Catholic Church," Mascarenhas said.